AMAPs geographical coverage extends from the High Arctic to the sub Arctic areas of Canada, the Kingdom of Denmark (Greenland and the Faroe Islands), Finland, Iceland, Norway, the Russian Federation, Sweden and the United States, including associated marine areas. AMAPs work addresses circumArctic issues within the context of global systems - these are intimately connected. 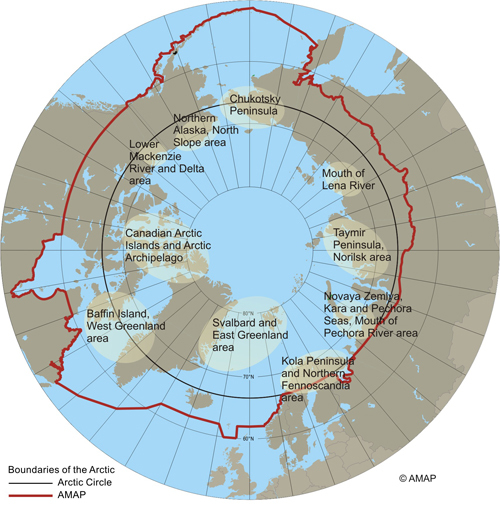 AMAP has established a circumpolar region as a focus for its assessment activities that includes both High Arctic and sub-Arctic regions. In the marine environment, the 'AMAP area' includes northern seas that extend as far south as 51.1 degrees N (James Bay, Canada). Within this region, 10 'key' areas have been identified for coordinated pollution monitoring studies. Where relevant to its assessment activities, AMAP's work extends beyond the Arctic to address global connections associated with long-range transport of contaminants, and global climate linkages. The AMAP Arctic region, together with other definitions of the Arctic are discussed in AMAPs 1998 assessment report available at the following link: AMAP Assessment Report - Chapter 2.